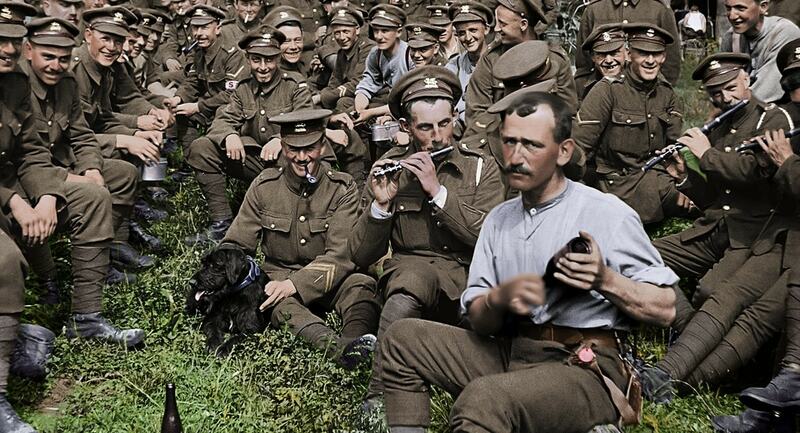 This amazing documentary, directed by New Zealand’s multi-award-winning Peter Jackson (Lord of the Rings trilogy), is a heartfelt homage to a gallant generation of WWI British soldiers. Jackson spent four years restoring long-archived footage from black and white movie reels. He succeeded in creating a mesmerizing experience of a war that ended 100 years ago for today’s viewers. My history-loving husband and I attended a screening of “They Shall Not Grow Old” at the Dallas Angelika Film Center recently. We were handed special glasses for Dolby viewing as we entered the auditorium. For the first ten minutes of the documentary, we watched black and white movie reel footage as young recruits queued up to join the army when Britain declared war on Germany in 2014. They were young (many of them admitting in later interviews they lied about their age to join the Army), and came from all walks of life. Many of the raw recruits were factory workers or unskilled laborers, eager for adventure. But as the recruits shape up and ship off to fight in Belgium, the documentary switches to full color and springs to life. Jackson’s magic touch takes the viewer into the trenches with these troops. We see them dig the trenches and discuss with typical British humor some sordid living conditions. Once the fighting starts the fun stops, though. As one soldier interviewed for the documentary noted, the war in 2014 was very different from the war in 2017 and 2018. Jackson uses interviews of soldiers who fought in the war, made in the 1960s and 1970s, to great effect. “They Shall Not Grow Old” is perfectly edited so the veterans’ narrative precisely describes the action on the screen. Warner Bros. Pictures’ 99 minute film is rated R for disturbing war images. Be prepared, some of the images are quite gruesome. I took off my Dolby glasses and closed my eyes during some of the most ferocious battle scenes. Opening at the Angelika Film Center on Mockingbird Lane Feb. 1.